Here at CabiNation we understand what makes a vacation home right for our guests. We make it our business to find vacation rentals of the highest standard that go above and beyond our guest's expectations. By providing the finest in vacation rentals we can ensure that our guest's vacation is a success no matter which property they decide to stay in. Marketing and Sales: we will build a listing for your rental cabin including the photography at no charge. 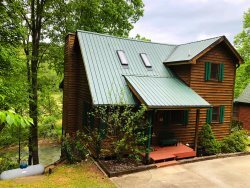 The listing will serve as the primary portal for potential guests to preview your cabin and this same listing will be shared with various other web based distribution channels such as AirBnB, the largest vacation rental site in the world and Mountain Laurel Cabin Rentals, one of the largest vacation rental sites in North Georgia. This system also manages all of the financial aspects of the property, including the owner statements and funds disbursement, and this is usually completed on, or about, the 10thof each month for the preceding month’s sales and revenue activity. CabiNation also generates reservations for your property using other means as well including electronic and print. As members of the Gilmer County Chamber of Commerce, we just entered into an advertising contract with them using the top banner of their website which attracts hundreds of thousands of visitors per year. Cleaning and Property Maintenance: we have numerous sub-contractors that we work with for housekeeping and property maintenance. They are very well trained and have very specific protocols they follow to ensure excellent quality. All of them are required to carry General Liability Insurance. We supply them with all of the cleaning supplies they will need to ensure consistency and high quality cleaning products. The property maintenance contractors are on call 24 hours per day, 7 days per week. Property Manager: each cabin is assigned a Property Manager that is completely familiar with your cabin and will change air filters, light bulbs, refrigerator filters and so on. This individual ensures that housekeeping and property maintenance have completed all of their assigned tasks to the level of quality you expect. In short, they manage the property to ensure great guest vacations and a protected investment for you. Linens and Laundry: we will supply the linens for your rental cabin, and we will also launder all of the linens as well in our commercial, state of the art washers and dryers. These are high quality, white linens including the sheets and towels and bathmats. We will launder the comforters and blankets once per quarter or on an as needed basis if required sooner. Owner Portal: we have a powerful reservation system that manages the guest’s experience from beginning to end. From the moment the reservation is booked and payment is received, the guest will receive numerous communications to ensure they have all the information needed for their upcoming stay. Additionally, you as the property owner, have access to much of the same information. You can view your bookings, property calendar, monthly statements and you can book your own stays as well. Damages, Insurance and Claims: from time to time accidents happen, and we will manage the process of ensuring that a damage claim is filed to ensure timely recompense for any damages. Once payment of the claim has been made, we can also assist and manage with the repairs and/or replacement of the damaged item. Third party channels such as AirBnB have their own, unique claims process while we also have a $200.00 security deposit and/or CTA Insurance which the customer can purchase to protect against damages. Tax Collection and Submission: we will collect, via our software reservation system, all of the taxes due to the State of Georgia and Gilmer County. We will also submit and pay these taxes on your behalf.